- Is it possible to include the item list in Illustrate in the exported illustrations (for example in .jpg or .iso, cgm files)? - Is it also possible to include the item list in a pvz file when publishing the illustration to a pvz file? it is not possible. What you can do is copy the item list and paste it later for example in Excel. 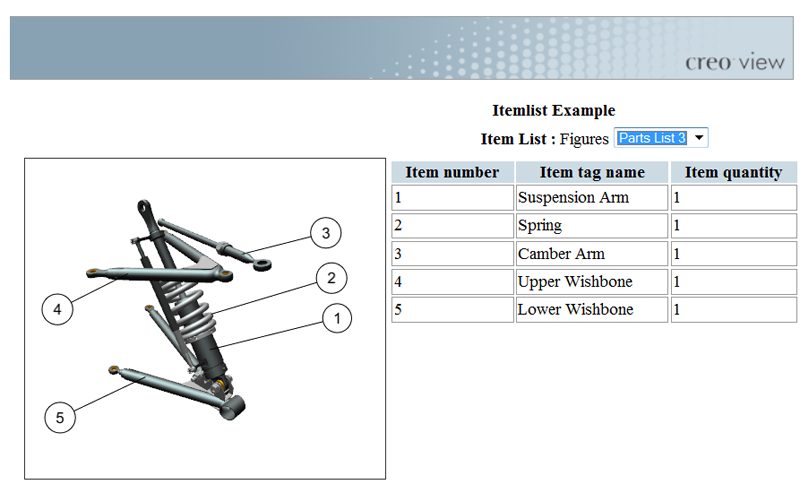 Here is an example of an item list automatically generated by the Creo View Web Toolkit in a webpage. The content of the item list is populated on-the-fly from the content of the 3D illustration. Is it possible to do somethig similar for non Web outputs? Ideal would be for publishing directly from Creo Illustrate, and also to be able to process in an XML (Arbortext) Editor so that the List could be included with the Image. It would be great to see the instructions for the creation of such a integration with Creo View Web Toolkit (printed guide / tutorial videos). This is documented in the Creo View Web Toolkit and a sample file is provided.